We're using whatever influence we have to remove barriers to youth growing into successful adults - whether in the child welfare system, in colleges' and universities' policies and practices, or in state and federal policies. Join these efforts by adding your voice to the cause. Thank you for supporting this Illinois bill waiving tuition for all youth from foster care! 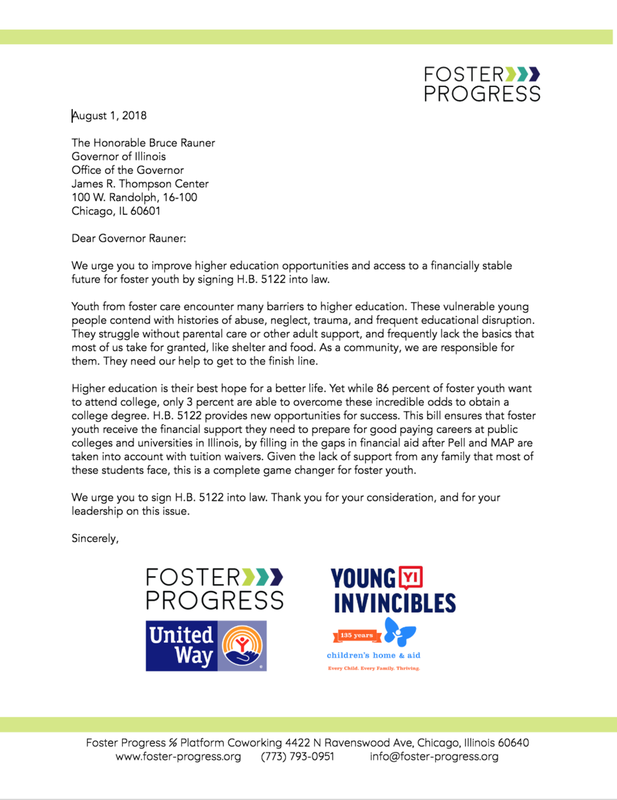 UPDATE Friday, August 24, 2018: Governor Rauner signed HB 5122, Tuition Waivers for Illinois Youth in Foster Care, into law! For more information about the specifics of the bill, click here. The Start to Finish Coalition, Children's Home & Aid, United Way, Young Invincibles, and ChildLaw Policy Institute at Loyola University, and all of the individuals who called and wrote to the governor and legislators! UPDATE Wednesday, May 30, 2018: Thank you to all who called, All we need now is the signature of the governor! A week ago, we alerted you to H.B. 5122, a bill that would provide tuition waivers and fee waivers for all youth in Illinois foster care. Because of the cost of related stipends, the bill has taken a small step backwards. However, there is a good chance it could still progress to the full Senate, especially if members hear how important it is. The bill will be voted on by the Human Services committee on Tuesday 5/8. It's important for committee members to hear from you about how important this bill is for foster youth! We are hosting a virtual call-a-thon on Monday 5/7 from 12pm-5pm with a goal of getting a 100 supporters to call at least 2 committee members. Do you have five minutes to spare? Please see below for the committee members' phone numbers and join in today! Even easier, fill out a witness slip as a proponent of the bill. Your voice matters to your state senators! House Bill 5122 (H.B. 5122) would create tuition and fee waivers to allow all Illinois foster youth to attend college, after taking into account other financial aid. The bill specifies that youth must have a high school diploma or high school equivalency and gives youth the option to attend any public university or community college in Illinois. This is an amazing opportunity for our youth to build a successful and stable future for themselves. The bill has already passed the Illinois House and will now be heard in the Senate. It may be voted on soon. It's important for Senators to hear that voters in their communities support this bill. Please call your State Senator and ask them to vote in favor of H.B. 5122. Let's make a lasting commitment as a state to support our foster youth into adulthood. 1. Breath deeply- it is legislators' job to hear from you and represent you. 3. Call the number in Springfield. 4. When the Legislative Assistant answers use the attached script to tell them you are a voter from the district and tell them you are in favor of H.B.5122. Tell one or two reasons why. Ask them how the Senator plans to vote and ask that the Senator vote in favor. 5. Pat yourself on the back- you took a stand for foster youth today! We're asking our senators and representatives to sign on as co-sponsors these two bills, which would make college more affordable and accessible for the youth we serve. Learn more about the Higher Education Access and Success for Homeless and Foster Youth Act. Learn more about the Fostering Success in Higher Education Act of 2017. Copy and personalize the sample letters below. Feel free to paste them into an email or send them via postal mail to your senators and representative. Phone calls are even more effective!